Established in 1889, First Federal Savings Bank has been serving the needs of its customers for over 125 years. First Federal Savings Bank is a Mutually owned bank with 12 locations to serve you. Our corporate headquarters is in Ottawa, Illinois. As a Mutual Savings Bank, we cannot be bought or sold. Our name will remain the same. We are a full service bank that is big on service! 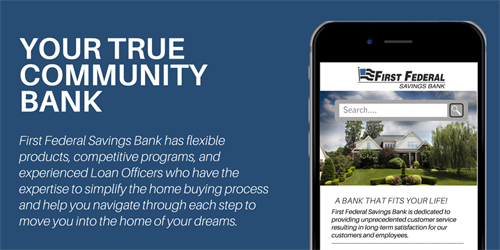 With everything from checking to home loans First Federal has a complete menu of products and services to meet your every need. First Federal Savings Bank's Morris branch is located in downtown Morris two blocks north of the Grundy County Courthouse.